Waheguru Ji Ka Khalsa Waheguru Ji Ki Fateh. Hukamnama today is on Ang 519 of Sri Guru Granth Sahib Ji in the Goojaree Kee Vaar by Sri Guru Arjan Dev Ji Maharaj. Satguru Paadshah Ji says I am lagrhee suthaan, suthaan, means place,su - sassa with an Onkarh beneath it means the most beautiful place, the highest place, the best of all places. jorhanhaarai jorhee-aa, jorhhaanharai, means the one who can attach me, the one who can unite me, has jorhee-aa - has united me to that place, has taken me to that place. What is that place? What is the best place? What is the highest place to be attached to? 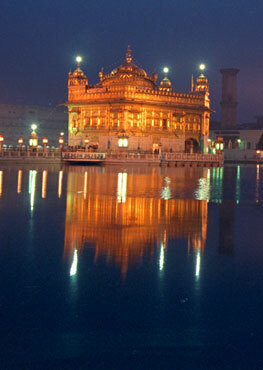 And that is the court of the God, Waheguru. waheguru is the greatest to be attached to. Guru Arjan Dev Ji Maharaj is saying to us today lagrhee suthaan - I am attached to God but how this attachment, this union come about. jorhanhaarai jorhee-aa, the Guru who is the uniter, the Guru who can take that soul who has been wandering from many lifetimes and join them to Waheguru, that Guru is the one who has jorhee-aa, who has attached me to God. The light of Guru Nanak Dev Ji Maharaj is saying to us today lahree lakh sai aan - in this world, there may be hundreds, there maybe thousands of lahree - means waves; waves of anger, waves of ego, waves of greed, waves of deceit, waves of depression, waves of happiness, waves of torment, all of these waves are coming against me but Sri Guru Arjan Dev Ji Mahara, the light of Guru Nanak Dev Ji Maharaj is saying to us today,aan duban day-ay na maa piree, maa piree - my beloved Guru will not let me duban, duban means to drown. My Guru has attached me to Waheguru, and being attached to my beloved Waheguru, my beloved does not let me drown. My beloved Waheguru keeps me safe in the storms of torment, and others storms in life. Guru Kay Piaario, we are always looking for someone in our lives. Whenever a wave of grief comes, a wave of death comes, a wave of torment comes we are always looking for support. Guru Arjan Dev Ji Maharah is saying if you take support of God, God's love will not let you drown. Guru Sahib Ji carries on with this theme. But Guru Sahib Ji changes the metaphor here. ban means forest,bheehaavalai means scary. In the scary forest, in the terrible worldliness, hik means one,saathee means friend. When you are in times of grief, when you are in times of doubt and especially imagine whe you are in this metaphor, walking by yourself in the forest by yourself, the sounds of animals are there, it is dark, it is cold; what do you want at that time, you want more than anything, you want someone else to be with you, someone to hold your hand, someone to help you through. You want an companion. That is what happens in our life, we go into periods of pain or stress. We are always looking for someone else, for a companion, someone who can share the pain with us. And many times we are trying to look for this, in our friends, in our relatives or whatever else. And that is all well and good but we must remember that ultimately, Guru Granth Sahib Ji, The Banee says jis manukh pai karaho bayntee apnay dukh bhari-aa If you tell one pain to someone they will tell you thousand of their own. If you want to get rid of these there is only one place to go to Guru Arjan Dev Ji says. There is only one true companion. hik saathee laDham In this forest I have only one companion, one friend. Guru Granth Sahib Ji's Banee tells us, who is one companion? eet oot nahi beechrai oh sangee ganee-ai Guru Sahib Ji says that who does not let go of your hand in this world and in the next even after you die, that is yoursangee, that is your companion. If you ask the Guru who is the companion you have found? dukh hartaa har naamaa with the grace of the Guru who has united me to Waheguru I have found dukh hartaa, hartaa means to remove and dukhharnaamaa - the name of God. Satgur Ji says in this forest I have found a friend and that friend takes away all of my pain and what is that friend - the name of God. Sri Guru Nanak Dev Ji's light says to s today, bal bal jaa-ee, I am a sacrifice again and again to the beloved saint, to my Guru and with the grace of the Guru what happened. nanak pooran kaamaan, kaamaan - the nanna and the kanna has a bindi on top which means it is plural all of the desires of my mind have been fulfilled now that I have found my friend, the name of God with the grace of the Guru. And another meaning which can be taken from this nanak pooran kaamaan All of these works which I came down on to this earth, what I came to accomplish, the meaning of my life has been fulfilled. What is the meaning of this life? gobind milan kee eh tayree baree-aa - meeting God. With the grace of the Guru you life will be blessed and fulfilled. O Waheguru when I was rati-aa, when I was imbued, colored in your love, paa-eean I receivedsabh means all, niDhaan means treasures. The treasures I received are countless , I didn't receive one or two I received every treasure. I did not receive which could be counted,sabh means all treasures are mine now. Those who japti-aa chant God's name, meditate upon Waheguru, they have no pachhhotaa-o, they have no regrets. Their regrets are washed away. Why? Regrets come when we do something bad, when we walk on the path of meditation, the bad thoughts would be erased from our minds and there will be no regrets. In this line Guru Arjan Dev Ji is saying to us: pahuch literally means to arrive at, to be equal to, there is no one equal to that person who has tayree tayk who has your support, whoo is yourjan who is your servant. No one can approach them in a bad way. Those people who have the support of God's name, does not matter what happens they are beyond the grips of pain. That perfect Guru who has united me to God vaahu vaahu all hail to that Guru. sukh lahaa chitaar man You will get peace and happiness, if you remember God through the grace of the Guru. 10:55 is true sayvaa, Guru Ji says that is saachee sayvaa,sayvaa is true that naam samaanee, that merges with Naam. Sayvaa and Simran are both connected Guru Ji is saying. The Guru has the bhandaar, the treasure of sift means the praise of God. karmee paa-ee-ai, Through the Guru's grace, karmee, when the Guru blesses you , you obtain this treasure of God's praise. When the Guru looks at you with grace, when the Guru bestows his grace of glance upon you, nadar nihaal bahurh na Dhaa-ee-ai, bahurh means again and again, na Dhaa-ee-ai means to not wander, you do not wander into reincarnation again and again. You are united with God. Thatda-i-aal merciful God, he rakhai, saves us himself. kar daasaa aapnay He makes us his servants. And then when one becomes the servant of God, what do they say, they say the name of Hari. jeevaa sun sunay By listening to the name of the God, that is my life. As Guru Granth Sahib tells us jeevoh naam sunee jo suparsan bha-ay gur pooray tab mayree aas punee Guru Nanak Dev Ji says aakhaa jeeva visrai mar ja-o saying the name of God is my life. Just like a fish cannot live without the water so a servant cannot live without the name of God. So daas cannot live without the name of his beloved.